Machines help make work easier, like when you need to lift something heavy or reach way up high. There are six simple machines: the lever, the wheel and axle, the pulley, the ramp, the wedge, and the screw. Can you adjust a seesaw to lift an elephant? What happens when you combine two or more simple machines? Read and find out! 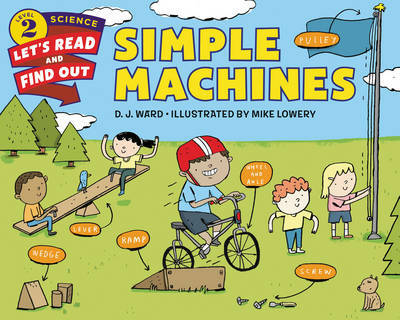 With colorful illustrations and engaging text, Simple Machines will delight young readers who love figuring out how things work. Featuring rich vocabulary bolded throughout the text, this book also includes a glossary and a find out more section with a lever experiment and web research prompts. Both the text and the artwork were vetted for accuracy by Dr. Babatunde A. Ogunnaike, dean of the College of Engineering at the University of Delaware. This is a Level 2 Let's-Read-and-Find-Out Science title, which means the book explores more challenging concepts for children in the primary grades and supports the Common Core Learning Standards, Next Generation Science Standards, and the Science, Technology, Engineering, and Math (STEM) standards. Let's-Read-and-Find-Out Science is the winner of the American Association for the Advancement of Science/Subaru Science Books & Films Prize for Outstanding Science Series.